A clear sky. Low 42F. SW winds at 15 to 25 mph, decreasing to 5 to 10 mph..
A clear sky. Low 42F. SW winds at 15 to 25 mph, decreasing to 5 to 10 mph. Magic Valley Amateur Radio Club member Mike Payne points out a ham television to Bella Mae Evans, 2, while club member Lee Kelly, foreground, gets razzed by his wife on the radio during the 52nd annual Jamboree on the Air at the KOA campground Saturday afternoon in Jerome. Kelly has created the trailer for possible emergency response missions. Boy Scout Ozzy Otto, 10, gets close to focus his ears on Dr. Miles “Doc” Humphrey’s mobile ham radio during the 52nd annual Jamboree on the Air at the KOA campground along U.S. Highway 93 Saturday afternoon. JEROME • Magic Valley Boy Scouts dialed into an old but reliable mode of communication Saturday with the help of a ham radio club. Before it was over, area Scouts had spoken to troop members in Wyoming, California and Portugal. 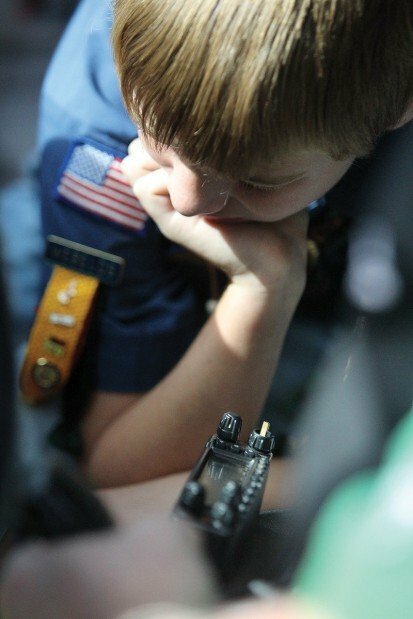 For many of the scouts, it was their first experience with amateur radio. The event at the Twin Falls/Jerome KOA Campground was part of a worldwide Boy Scouts Jamboree on the Air. Scouts from 100 countries were expected to participate. Members of the Magic Valley Amateur Radio Club set up three ham radio stations at the campground and were eager to share their knowledge. Nearly 50 Scouts from the Snake River Area Council participated. Ham radio might seem like a relic in the smart phone/Internet age, but area club members said the hobby is still relevant. As scouts huddled around the radio sets, club members helped them reach others around the globe. With a turn of the dial, the sound of static suddenly turned to voices. Amateur radio has helped provide emergency communication during every major natural disaster in the past 50 years and will continue to be a factor, he said. Victims of Hurricane Katrina and the January 2010 earthquake in Haiti would have been “cut off from the rest of the world” if it hadn’t been for ham radio operators, Kennedy said. “When all other communications fail, ham radio operators will still be talking to each other and providing communications for those in need,” he said. Miles “Doc” Humphrey, the club’s vice president, used a mobile unit to reach other ham operators on Christmas Island in the Pacific and a group of Scouts in Portugal. 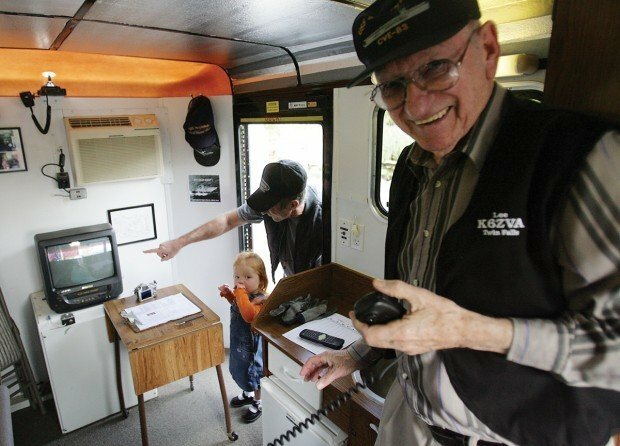 Helping Scouts connect with each other via the amateur airwaves is the whole idea behind the annual Jamboree, said Humphrey, who got hooked on ham radio in 1956 at the age of 15. Amateur radio operators have a long history of helping Scouts learn radio communication skills. The Boy Scouts offered the first Wireless badge in 1918. In some ways, ham radio has actually benefitted from the Internet, club members said. Radio enthusiasts often post instructional videos on YouTube, said member Michael Payne. Thank you for the positive story about Ham Radio and scouting a wonderful combination to be sure. I do take issue with the use of the words "old" and "past" and "relic.". Catchy writer's hook words but in fact Amateur (aka Ham Radio) has always stayed vital and current and has pushed many technologies, for decades. Ham Radio has used computers for decades and has been using their own earth orbiting satellites since the 1960s - hardly a "relic". Ham Radio is a great service to the community and very useful for family and friends to stay in touch with each other during emergencies and disasters. If you are interested in learnning more go to this website, http://www.arrl.org/new-to-ham-radio. Many thanks. This is Bruce N1BN signing off. Looking at ham radio as something from the past is incorrect. It is true that Amateur (Ham) Radio has a rich history, with amateurs pioneering many communication technolgies ove the last 100+ years. Nearly a century ago, "hams" were given the higher radio frequencies because "professionals" thought they were of little value for communications. Hams succeeded in using them. Before WWII, when everyone was mostly using CW (code) or AM, hams pioneered the use of SSB modulation, which the US military then began to use. Hams had a world-wide radio-based digital communication system over 10 years before the Internet was commonly available to the general public. There are many such examples. While some hams like to use vintage equipment and operating modes, ham radio is very much a modern high-tech activity. We use software-defined radios and advanced digital communications modes. We have many Anateur Radio satellites in orbit and there is amateur radio equipment aboard the International Space Station. Yes there are new communication technologies available to the public, no license and no technical knowledge required. The difference betwen ham radio and everything else is that we can communicate across town or around the world independent of any commercial infrastructure such as phone lines, cell towers, DSL, cable, and anything else. Looking at ham radio as something from the past is incorrect. It is true that Amateur (Ham) Radio has a rich history, with amateurs pioneering many communication technolgies ove the last 100+ years. Nearly a century ago, "hams" were given the higher radio frequencies because "professionals" thought they were of little value for communications. Hams succeeded in using them. Before WWII, when everyone was mostly using CW (code) or AM, hams pioneered the use of SSB modulation, which the US military then began to use. Hams had a world-wide radio-based digital communication system over 10 years before the Internet was commonly available to the general public. There are many such examples. While some hams like to use vintage equipment and operating modes, ham radio is very much a modern high-tech activity. We use software-defined radios and advanced digital communications modes. We have many Anateur Radio satellites in orbit and there is amateur radio equipment aboard the International Space Station. Yes there are new communication technologies available to the public, no license and no technical knowledge required. The difference betwen ham radio and everything else is that we can communicate across town or around the world independent of any commercial infrastructure such as phone lines, cell towers, DSL, cable, and anything else. I was part of the team in Livermore, California that had a conversation by ham radio with the Jerome Jamboree on the Air team. It's neat to read about your experience and see pictures of your group.